University students in Windsor might be tempted to follow up on an offer to buy custom essays so they won't have to do the work themselves, but a local professor says they are unlikely to get what is being advertised. When walking to his office on the University of Windsor campus recently, André Narbonne noticed a series of posters offering "custom essay writing" to students. The English professor tore them down as soon as he saw them. Narbonne said he knew his reaction wouldn't stop plagiarism, but he was disgusted by what the posters had to say. "These suggest that plagiarism is normal behaviour and I find that difficult, to say the least," Narbonne told CBC News in an interview. 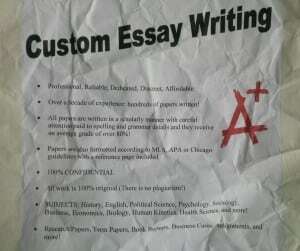 The posters claim that all papers purchased will be written "in a scholarly manner with careful attention paid to spelling and grammar," with the recipients getting an average grade of 80 per cent or higher. A graphic showing an "A+" appears on the posters as well. Narbonne said there is no way the people buying these products will get what they want. "I don't believe that people who go to these services get A-pluses in classrooms," Narbonne said. "For one thing, they are not learning how to write and if they are not doing the work, they are probably not going to do well on the exams, they are not going to do well especially in [the] class participation component — I consider that to be the real equalizer. You can't plagiarize what you think." Matthew Dunlop, the vice-president of student advocacy for the University of Windsor Students' Alliance, said he knows students who have used these types of services before and he believes that stress has motivated many of them to use them. That said, Dunlop said he worries about the long-term impact of people who are choosing to find ways around doing the work they are required to do, and what that implies about their personal integrity as well as their level of knowledge when they graduate. When Narbonne heard about the suggestion that stress might be a factor that's motivating students to pursue these types of services, he said, "I don't think you should get into something that you don't have an aptitude for, necessarily. "I mean, if you can't do the work — if you can't write English papers — maybe you should not be in an English class. If you can't do math, perhaps you shouldn't be taking math." Narbonne also said students pursuing this approach are not recognizing that tuition is not a payment that guarantees a degree or a particular outcome. "You're not paying for a grade when you pay your tuition. You're paying for an opportunity to learn," he said. "The university provides that. And this is a way of not learning, a way of sort of getting around that."